You need three bowls to make this ice cream – but it is SO worth it! 1 To make the coconut ice cream, separate eggs, putting whites in a grease-free bowl and yolks in a large bowl. Beat yolks with 70g (about ⅓ of a cup) of caster sugar until thick and creamy and pale yellow in colour. Lightly whip cream in a separate bowl. Stir coconut cream into beaten egg yolks and sugar, then add whipped cream, and mix gently until well blended. Whisk egg whites until very stiff, then add the rest of the sugar and beat for 30 seconds. Using a large spoon, mix into egg yolk mixture with lemon zest; do not beat. 2 Transfer mixture to a container and freeze for at least 6 hours (it’s at its peak when nearly frozen). If making the ice cream ahead of time, allow it to soften in the refrigerator for up to 40 minutes before serving. 3 For the hazelnut crush, see here for toasting hazelnuts. Put biscuits in a clean plastic bag and smash with the end of a wooden rolling pin. Chop hazelnuts coarsely. Heat butter in a medium-sized frying pan over medium heat and add crushed gingernuts, hazelnuts, lime zest and coconut. Toast gently, stirring often with a spoon to ensure mixture doesn’t burn. Tip onto a large plate to cool. 4 If using fresh mangoes for the purée, peel and remove flesh from pits. Mash fresh or canned mango pulp to a purée with a fork, then push pulp through a sieve to make it smooth. Add a few squirts of lime juice to brighten the flavour. Cover and refrigerate (the purée can be made a few hours ahead). 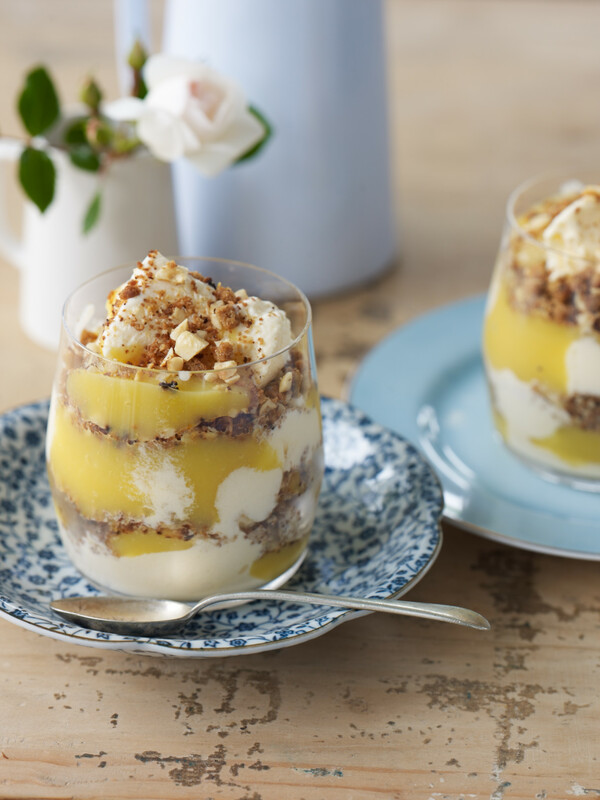 5 When ready to assemble, put scoops of coconut ice cream into serving glasses and top with spoonfuls of mango purée and sprinklings of toasted hazelnut crush. If you like, top with fresh fruit such as sliced strawberries or bananas. Serve immediately. An ice cream churn will definitely improve the texture, but it’s not essential (it’ll take about 20 minutes to churn). The trick is to move the ice cream from the freezer to the refrigerator about 20–40 minutes before serving, to allow it to soften without melting. Coconut cream gives a rich coconutty taste. Let the can stand for an hour before using so that the cream can float to the top of the liquid. Use any remaining coconut liquid in rice or chicken dishes. Toasty roasty coffeeish – that's toasted hazelnuts! Here's how to do it.